Canoe Sailing Rig: Combine 2 great water activities into one! Combine 2 great water activities into one! Learn how to set up a Canoe Sailing Rig, and catch the tail wind when canoeing. Cover more distance with your group in fun! 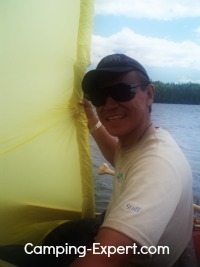 Learn what makes the best canoe sail too! If you’re like me and love spending time on the water, then you love sailing, canoeing, kayaking, or even better combining canoeing and sailing! If you’ve never done it before, you might not know how to set up. Sailing a canoe can be very different than regular sailing, but definitely a whole lot of fun. Plus it makes your canoeing go much faster! When I’ve gone canoeing, I’ve always had a group of 8 people and 4 canoes, but that doesn’t mean that you can’t sail with just 1 canoe, it’s just different. Materials: Paddles, and 1 large tarp. Bring all 4 canoes side by side. The paddlers at the bow will turn around while all canoe-ers hold the boats together. 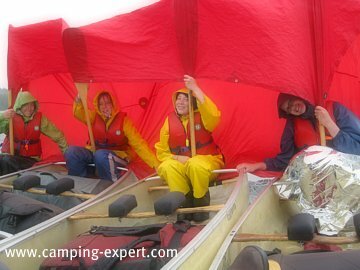 Then once the front paddlers have turned around, they all sit on one end of the tarp, and bring it up behind their back. The other end of the tarp goes over the paddles, which the front paddlers have propped between their legs pointing up. All canoe-ers hold the canoes together by having their legs laying over into the canoes on each side. The strongest and most competent steerers need to be on the outside back of the formation, and will be steering the whole canoe raft. Now you've set up a canoe sailing rig! If you want to make a canoe sailing rig with just one canoe, then, the bow paddler will use the spare paddle to create a V-shape and put the tarp between the two paddles. There are some safety considerations that need to be taken into account when canoe sailing. · Do not tie the boats together. If you need to quickly disassemble, because of strong winds, you do not want to be fussing with knots. · You need a tail wind to go the right direction. A side wind may cause your boats to flip over. · If you are sailing and the waves get too big, let all canoes separate, and paddle to shore, perpendicular to the waves so you don’t flip over with a wave. · Make sure that you keep an eye on people’s temperature. Since people aren’t moving, it is easy for people to get cold if it starts to rain. Make sure everyone is warm. Canoe sailing is one of my campers favourite activities (and mine too), and is a great way to talk with your whole group, have some team building and bonding and cover great distances in quick time together. I’ve always had a lot of fun canoe sailing and would recommend it if you have a tail wind. It’s particularly great because you don’t need to bring any extra materials. Which Canoe Sail do I get? What should I use as a Canoe sail? What canoe sail would I recommend? This is what I’ve always used and would totally recommend it. It’s light weight, packs up small, and it opens up quite big. Plus, it’s waterproof. It might be more expensive than a cheap tarp. But cheap tarps are just that – cheap. They only last 1 season, and are heavy and take up along of space in your bag. So, I like to use lightweight, large area waterproof tarp. If you have any questions about this, feel free to contact me. Check out more Canoe camping ideas and information.